I seemed to have stopped writing reviews about BSG, so I thought it was time for a cathup. Season 2 is certainly a tale of two halves. While the first half is almost entirely self-contained within a single story arc, the second half has far more standalone eps which seem very much focused on delving deep into the character relationships with one another. In order to take on a Cylon fleet, Adama and Cain form an uneasy truce. However as the eve of battle approaches, more revelations about the brutal nature of Cains command surface and Adama is forced to make an impossible decision. This is a fantastic two part conclusion to the cliff-hanger 'Pegasus'. The tension is palbable and for the first time in the shows run we get to see the Galactica (and Pegasus) take on a couple of Base Stars. The second part sow the seeds for a number of key elements of the shows future, including the emergence of a 'Gina', a number 6 model cylon, befriended by Baltar. It's a very strong two-parter and while the conclusion and Cains ultimate fate are somewhat unoriginal it's wonderful to see the rag tag fleet go on the offensive for a change. After the excitement of the previous few episodes it's back to politics for all concerned. With Roslin seemingly hours from death the concept of Baltar becoming President nears reality. We have been told for a long time that the baby Sharon is carrying is 'special' and the first inklings of this become clear here. Sadly, the episode is let down by a very rushed conclusion that feels too much like a kop-out. 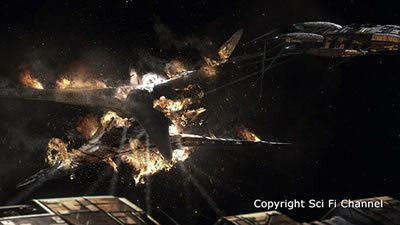 There are some interesting revelations, such as Baltar finally accepting that he has lost the trust of those around him and as result setting in motion a chain of events that will have lasting consequences for the fleet. However, on the whole it is a mixed bag ep. Since his near death experience in 'Resurrection Ship' Apollo is a much changed character. He is detached and seemingly losing his way. While this episode offers more of an insight into the running of the fleet and sees Roslins and Baltars relationship descend even further, it is very much a standalone character ep for Apollo. While the conclusion offers Apollo a deeper understanding of human nature and it's survival instinct I was left with the impression that there was no easy fix for this man living in his fathers shadow. The Viper pilots' deadliest foe is an enemy Raider that they've nicknamed "Scar" — the combat-savvy reincarnation of countless Cylon warriors that boasts a growing list of human kills. Hiding out in the asteroid belt, Scar is a master of hit-and-run attacks that are decimating the war-weary Viper squadrons and forcing them to throw inexperienced replacement pilots into the fray. After the Apollo ep we now get a Starbuck ep. Her character is also much changed since her visit to Caprica. He longing to return to Anders and her depression at everything around her seems to push her further and further towards self-destruction. Here we see her competing against Katt to be the one to kill Scar. Unfortunately, the ep suffers from too much Top Gun style bravado that just doesn't seem to fit. The direction the writers have taken Starbuck is certainly interesting, but all to often does this ep get bogged down in too much cheese. Fleet-wide paranoia reaches a new peak when word leaks out that the Cylon Sharon is secretly being kept alive aboard the Galactica. Sesha Abinell, a civilian who is grieving her husband's tragic death during a Cylon raid several weeks earlier, takes the occupants of a bar on Cloud Nine hostage, including Apollo, Helen Tigh, Billy and Dualla. 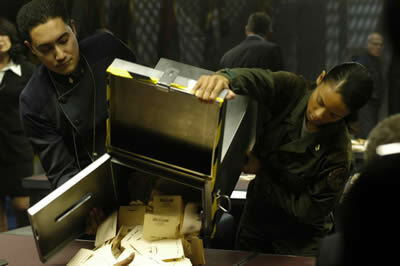 Lots of soul searching here as Adama is forced to weigh the value of keeping Sharon alive in a holding cell. We also get to see a continuation of Starbucks reckless attitude to life as she completely botches an attempted rescue; an attempt that leaves Apollo in critical condition. Adamas eventual desperation may win the day, but it comes at terrible price. After the disappointment of 'Scar' things are much improved. One of the things I like most about this show is that the characters are changing in ways that, may not be nice to see but, are very realistic when you consider the lives they now lead. Away from work, these people may try to have lives, but how can they when everything is a constant reminder of what they've lost? 'Sacrifice' is poignant and tragic, if a little contrived towards the end. A 17 year old pregnant girl arrives on board Galactica requesting an abortion, raising the question of whether abortion should be allowed in a dwindling society were every life counts. Meanwhile onboard Pegasus, the command abilities of newly promoted Commander Garner are called into question by his interim XO, Lee Adama. 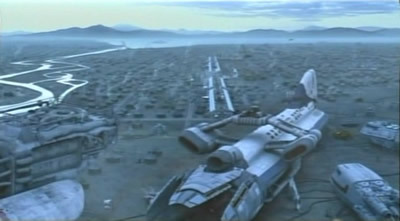 Scifi has always been a great genre for debating common moral issues and while in many ways the story onboard the Pegasus is the A-plot in this episode, it is the political side of the abortion debate that has the most weight. Roslin is no stranger to controversy, but her decision to outlaw abortion on grounds that she must do what is best for their society is strong stuff. It gives Baltar a platform to launch his own bid for the Presidency and leaves everyone questioning what should come first; the rights of the individual, or the rights of the society. The main plot onboard Pegasus is only mildly interesting, in that it illustrates how messed up things must have been following the demise of Admiral Cain. The strain on Starbucks and Apollos relationship is obviously reaching breaking point, a sub plot that has been good to watch in recent eps. The eventual demise of Commander Garner meanwhile is not at all unexpected. What is interesting is Admiral Adamas decision over who should replace him. Finally, after nearly two seasons we get a real insight into Cylon society. This is a superb episode that clearly shows how the humanoid cylons are becoming closer to their human enemies than they ever imagined. Both Sharon and Number Six are haunted by their memories posing as humans and their role in the near destruction of mankind. The whole episode leads to the question of, are the humanoid cylons more human than cylon now? Meanwhile on Galactica, Sharon gives birth prematurely leaving Roslin with a dilemma over what to do with the newborn baby, Hera. This is a very strong episode, one of the best of the season, and is clearly laying down the foundations of a possible Cylon civil war. 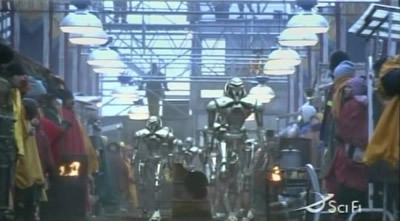 It seems a long time ago now that the cylons were just viewed as tin cans! As Roslin and Baltar go head to head in debates prior to the Presidential election, a daring rescue mission is launched to get Anders and the other members of the resistance off Caprica. Despite trailing heavily in the polls Baltar is given a lifeline by the discovery of a planet hidden inside a cloud that could offer the humans a new and safe home. Another really strong finish to a season of Galactica and yet again we are treated to an almighty twist. 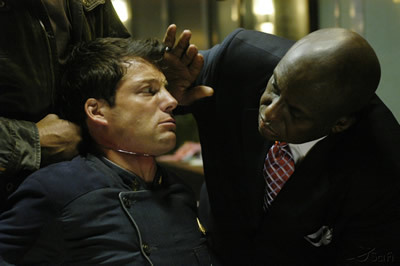 The rescue mission on Caprica is very much a side issue as the politics take complete centre stage. Facing the possibility of defeat and believing so clearly that Baltar was somehow involved in the original Cylon attack, Roslin faces up to the possibility that rigging an election may be worth it in the long run. There are so many things going on in this two parter that it can be hard to keep up. From the discovery of a new planet, dubbed New Caprica, to the uncovering of another Cylon agent. The eventual conclusion was so unexpected that it threw me completely and had people debating it online for months after it's airing. The final 10 minutes were a bold move by the writers of the show and it will be very interesting to see how they can follow this up. In summary, I'd say the second half of season 2 was not as strong as the first half. Too often did the writers rely on the "10 hours earlier" style of storytelling, while some of the plots (in particular Scar and Epiphanies) seemed too contrived. However, the season ended in fantastic style and left me desperate to see more.